are visiting or living in Korea. med or uncomfortable as there are many cultural differences and barriers that need to be taken care of. 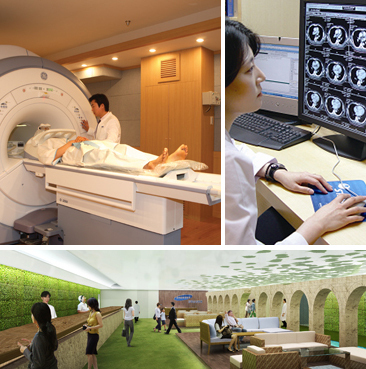 Kangbuk Samsung Total Healthcare Center provides the highest level of medical care and services with trained medical staff and state of the art medical equipments. Our first and foremost priority is your well-being and we will serve you in a discreet and respectful manner that goes beyond your expectations. in a very convenient location near you! We’re right in the middile of Seoul, near City Hall surrounded by embassies, five-star luxury hotels, corporate headquarters, government offices, and many popular tourist sites. City Hall is recognized as the cultural, economical, and political heart of Korea which bustles with life every day. the MRI, MDCT and PET-CT.
Kangbuk Samgung Total Healthcare Center is fully equipped with the most technologically advanced medical equipment such as the MRI(Magnetic Resonance Imaging), MDCT(Multi Detector Computed Tomography) and PET-CT(Position Emission Tomography-Computerized Tomography). Our center is also the largest in Korea (over 10,000㎟) emcompassing devices, our goal is to provide the most accurate diagnosis. Our medical equipments go through extensive maintenance procedures to keep them safe and minimize infections. Total Health Care Center of Kangbuk Samsung Hospital in Korea currently has a contract with Johns Hopkins University, School of Public Health for a medical cohort study since the year of 2009. Kangbuk Samsung Hopital currently has a contract with Johns Hopkins University, School of Public Health for a medical cohort study since the year of 2009. 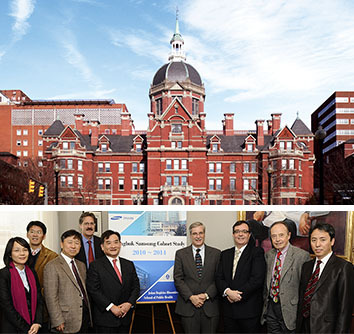 Johns Hopkins University highly appreciated and respected our extensive knowledge base in medicine, global standardized procedure of medical examination. dedication of research and education. Our center provides the most efficient, patient-oriented health screening environment. Two separate examination areas(one for men and one for women) are connected in the center. In each area, examination rooms are arranged along the borders, allowing clients/patients to move in a circular, motion without having to walk around long distances. Natural plants, streams, and rocks were placed throughout our facilities to give clients or patients a sense of re-laxation and comfort. Our gowns are made of organic material to avoid the allergic reactions.